The Animals/Pets on Campus Policy was introduced as a safety precaution to ensure the health and well-being of students, faculty and staff on campus. According to the board meeting’s agenda, the policy was implemented to avoid a pet or animal becoming a “health hazard, threat, nuisance or significant distraction” to people and events happening around campus. “After significant consultation with our community and extensive internal discussion with university leadership, in keeping with the university’s commitment to the health and safety of all those on campus, TRU feels the policy that we have implemented best serves the needs of our broader community,” said Matt Milovick, TRU’s vice-president administration and finance. 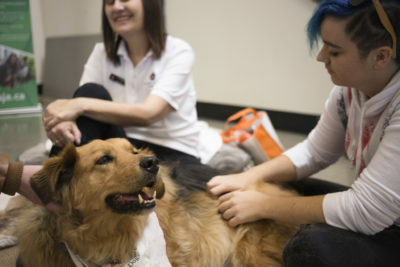 The agenda stated that this year alone, there have been two documented reports revolving around incidents where people have been bitten by dogs owned by employees and students. The new pet policy asserts that animals are unauthorized to enter the buildings, vehicles and facilities of the university. Pets are also banned from TRU residences “except as indicated in housing agreements” and animals that are on campus must always be restrained and under the supervision of their caretaker. The Omega spoke with students around campus to get their opinions on the new pet policy and some agreed that the health and safety of people on campus come first. “I feel like as long as, obviously, service dogs are able to still be on campus and the therapy dogs, that’s all fine. I heard rumors that there was a dog that bit somebody on campus that wasn’t a service dog, so I think if it makes the campus safer for everybody that it’s kind of good thing,” said Nicole Greenstreet. Despite that, there were still some students who admitted that they were disappointed in the new pet policy. “I like having dogs on campus, it’s nice to see them, it relieves stress and I’m an animal person, so I like seeing more animals on the campus,” said Marina Keast. Individuals who regularly bring their pets on campus have until Nov. 23 to make alternate arrangements. The Animals/Pets on Campus Policy comes into effect on Nov. 24.